Calonge is an agricultural village which is part of the municipality of Santanyí in the southeast of the island of Majorca. The activity of the population was divided between agriculture, livestock and fishing from the harbor Cala Llonga which is historically the port of Calonge. Since tourist urbanization of Cala Llonga, which is now part of the resort of Cala d’Or, the population - about 1,000 people - turned to tourism, working in Cala d’Or and lives in Calonge. 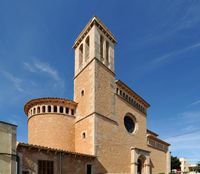 It is believed that the place name of Calonge comes from the name Gilabert de Cruïlles, lord of the namesake town of Calonge located in the county of Baix Empordà, in the province of Girona in Catalonia. Gilabert de Cruïlles was one of the nobles who participated in the conquest of Majorca in 1229. In 1236, Calonge appears in historical records as the Alqueria Coloia. Calonge is situated at the foot of the last heights of the Serra de Llevant a few kilometers from Sant Salvador sanctuary of Felanitx and Santueri castle which dominates the south-east coast of Majorca. 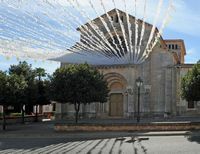 The village lies midway between the cities of Felanitx and Santanyí and 5 km from the coast and the resort of Cala d’Or. The first church of St. Michael was built in 1801 Calonge. The church was extended for the first time in 1845, but again became too small. 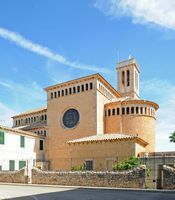 In 1903, construction of the present church, neo-Romanesque style began and in 1909 the church was consecrated by the Bishop of Mallorca, Pere Joan Campins. Festivities of St. Michael is celebrated on September 29. In 1715, after the end of the War of the Spanish Succession on the continent, Calonge was the scene of a fight between supporters of the Bourbons - who landed in Cala Llonga - and supporters of the Habsburg dynasty, which still held the island of Mallorca. Supporters of the Austrian dynasty, who had been defeated in the peninsula, were defeated and lost Mallorca.